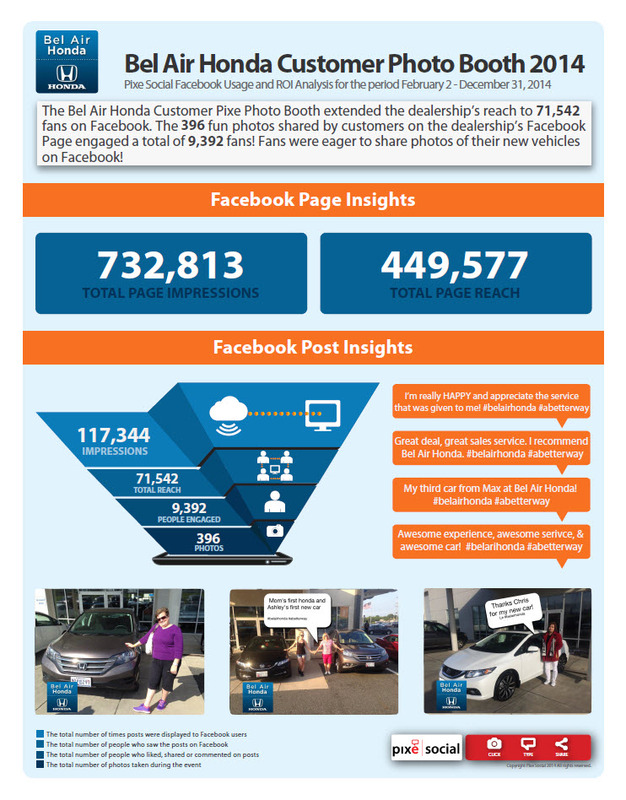 Pixe Social, the Maryland based, digital marketing solutions provider, delivers impressive results for local auto dealership, Bel Air Honda. Bel Air Honda was first introduced to Pixe Social at the 2013 National Automobile Dealers Association Convention & Expo. Pixe partnered with NADA to capture event attendees with their award-winning tablet-based social photo booth technology. Ashleigh Williams, Bel Air Honda’s Marketing Manager, saw a unique opportunity to capture photos of their satisfied customers with their new cars. With 1,800 followers on Facebook, Bel Air Honda already had a solid reach into its social community. Knowing that photos are an important part of social engagement, the company was interested in obtaining more pictures from customers to further animate and engage its fan base. Photos taken at the dealership were automatically shared on their Facebook Page, allowing customers to tag themselves and share the photos within their own social networks. In addition to the increased visibility of the dealership, with Bel Air Honda branding placed on each photo, Pixe Social’s solution became an excellent opportunity for personal branding. One salesman, who is particularly fond of using Pixe with his customers, was a standout on the company’s Facebook Page. “Sales associate Peter has sold a great deal of vehicles due to word of mouth [Pixe Social] with all the likes and comments his customers’ photos receive. It’s helped move him from the middle of the pack sales associate to one of the top,” Williams says. Bel Air Honda has taken 396 pictures of happy customers since they started using Pixe Social a little under a year ago. So far, the dealership’s reach has been extended to 71,542 fans and the photos shared by customers on the dealership’s Facebook Page engaged a total of 9,392 fans. “We love the Pixe Social app. Our growth on Facebook by customers and people engaging in the content of the photos is high,” Williams comments. With expansion to Bel Air Honda’s sister dealerships planned for the near future, Pixe Social will continue to provide Bel Air Honda an added interactive experience for customers on the showroom floor. This successful partnership has also widened the opportunities for Pixe Social in the dealership industry. Pixe plans to grow its presence in automobile dealerships across the country.